Known as the abrupt boundary between the planet’s magnetic field and the solar wind, magnetopause is one of the most important regions of solar wind-magnetosphere coupling. The study of its shape is not only of vital importance to space weather forecast, but also fundamental and crucial when it comes to physical conundrums, such as the solar wind energy transfer, Kelvin-Helmholtz waves, the open magnetic flux, et al. Over the past decades, space physicists developed quite a few empirical magnetopause models using the magnetopause crossings. Nevertheless, the quantitative changing of the magnetotail at various distances in association with the interplanetary magnetic field (IMF) conditions has not been investigated in a systematic way, due to the scanty magnetotail crossings and the limitation of in-situ spacecraft observations. Recently, using a self-developed global MHD simulation model (PPMLR-MHD), WANG Jiangyan, WANG Chi, HUANG Zhaohui, and SUN Tianran at the State Key Laboratory of Space Weather, the National Space Science Center (NSSC), revealed the control effects of the IMF conditions on the shape of magnetotail. The research group concluded that the cross sections of the magnetotail are not rotational symmetric but elongated along a certain direction close to the IMF direction. The elongated direction twists with the changing IMF magnitude, orientation and the distance away from the Earth. Using the multiple parameters fitting, they obtained an empirical expression which can describe the relationship between the twisting angle and above-mentioned influencing factors. Furthermore, the research group found out that the current sheet has a similar twisting behavior with the shape of magnetotail but with a smaller twisting angle. The simulated twisting averages of the current sheet are close to the observed statistical averages. It presents a good verification to their MHD simulated results. The research results are expected to provide references for the revision of magnetopause models and the studies of other physical problems of solar wind-magnetosphere coupling. The work entitled Effects of the interplanetary magnetic field on the twisting of the magnetotail: Global MHD results was published on the Journal of Geophysical Research (GRL) hosted by American Geophysical Union (AGU). 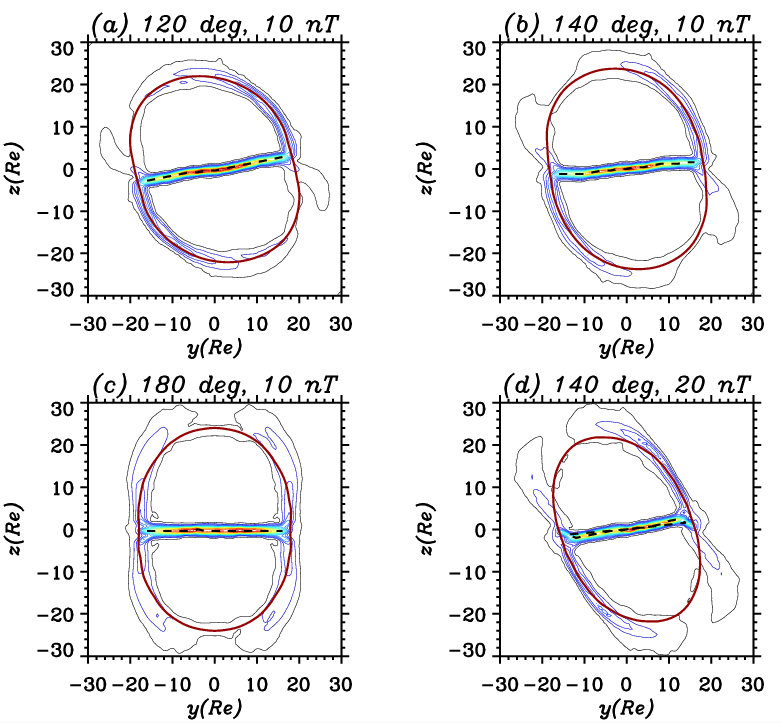 Citation: Wang, J. Y., C. Wang, Z. H. Huang, and T. R. Sun (2014), Effects of the interplanetary magnetic field on the twisting of the magnetotail: Global MHD results, J. Geophys. Res. Space Physics, 119, 1887–1897, doi: 10.1002/2013JA019257.